The cement industry is a major source of industrial CO2 emissions, contributing 5-6 % of global anthropogenic greenhouse gas emissions. Norcem AS, with its parent company HeidelbergCement Group and the European Cement Research Academy, is exploring various post-combustion CO2 capture technologies at small-scale to determine their suitability for deployment in modern cement kiln systems. 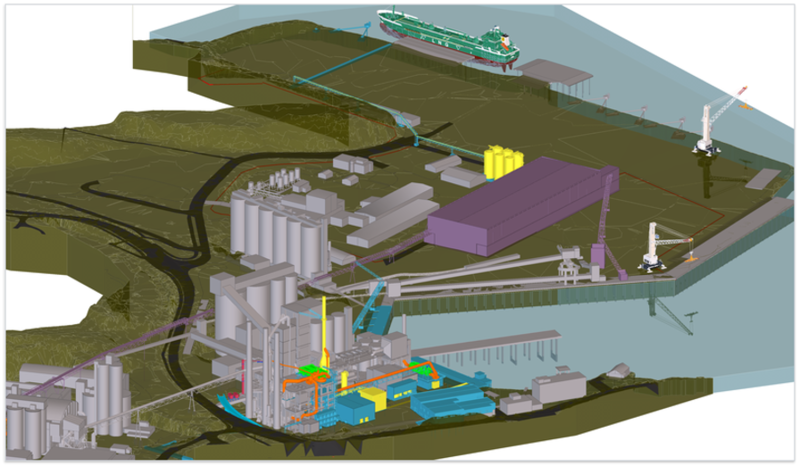 A full-scale capture at Norcem Brevik would be the first of its kind globally for cement production. It would achieve improved levels of carbon emission from cement installations, along with a new environmental standard for cement production in Europe. Alumina refining in Australia is energy-intensive and reliant on natural gas. A project looking at using concentrated solar thermal technologies such as low-temperature digestion, solar reforming of natural gas, and high-temperature calcination could lead to a 50% reduction of the natural gas consumed and may be applicable in other industries. The 15.1 million AUD project, led by the University of Adelaide, includes 4.5 million AUD in funding from the Australian Government though the Australian Renewable Energy Agency. The University of Adelaide, CSIRO and the University of New South Wales are contributing over 600,000 AUD in cash and 8.7 million AUD of in-kind resources, further supported by 620,000 AUD of in-kind contributions from industry partners including Alcoa of Australia Limited, IT Power, and Hatch. Steel manufacturing is one of the largest sources of CO2 emissions. Cutting these is necessary to achieve the goals set at the United Nations Climate Change Conference (COP21) in 2015. The €18 million H2Future, a Fuel Cell and Hydrogen Joint Undertaking (FCH JU) project, is one of the first to explore harnessing the power of renewable hydrogen to decarbonise steelmaking. An innovative electrolysis pilot plant will be constructed at the Voestalpine production site, currently one of Austria’s biggest greenhouse gas emitters. One of the largest and most modern electrolysers using Proton Exchange Membrane technology will be deployed to produce green hydrogen for industrial use, which will be fed directly into Voestalpine’s internal gas network for testing in various process stages of steel production. The EU backed project where Voestalpine, Siemens and Austrian utility Verbund join forces, represents the type of unique public private cooperation that is needed to address the complexity of curbing industrial CO2 emissions. By supporting research, technological development and demonstration in fuel cell and hydrogen technologies, the FCH JU aims to accelerate market introduction in order to realise the technologies’ full potential for achieving a carbon-lean energy system across multiple sectors. The HYBRIT project, supported by the Swedish Energy Agency, aims to reduce carbon dioxide emissions from ironmaking to zero by using hydrogen produced from “clean” electricity to eliminate the need to use fossil fuels for iron ore reduction. The project, led by Swedish companies SSAB, LKAB and Vattenfall, started in 2016 with a pre-feasibility study. A pilot demonstration plant is planned for 2018. The Carbon2Chem project of the Federal Ministry of Education and Research is exploring the utilization of smelter gases from steel production and hydrogen produced using surplus electricity from renewable energy sources to create valuable primary products, such as fuels, plastics or fertilizers. The Carbon2Chem approach is expected to make 20 million tons of the German steel industry’s annual CO2 emissions economically exploitable. Carbon2Chem will answer central questions of the energy transition concerning the storage of electrical energy and the stabilization of the electrical grid and build a bridge between basic research and the market. BMBF is providng more than €60 million funding for the project with partners involved expected to invest more than €100 million by 2025.